The Concorde Collection He Walks With Me Pendant - Diamond . . . 14K Gold over Sterling Silver - A token of his eternal presence . . .
A token of his eternal presence . . . 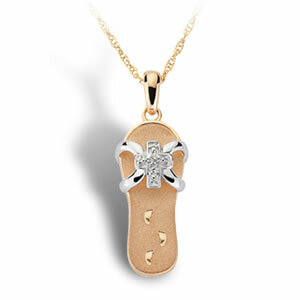 The comforting words of a favorite hymn inspired this sterling silver and 14K Gold-plated sandal pendant by award winning designer Thomas Sota . . . featuring a Diamond cross and tiny footprints that remind us of his eternal presence and guidance. The sandal measures 1 inch by 1/2 inch. A complimentary 18” chain is included.